Introducing Fred the flexible skeleton by 3B Scientific. 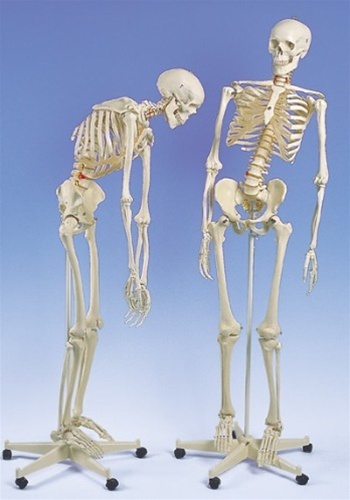 With an overall measurement of 170 cm, this flexible skeleton model will definitely give you a realistic view of an actual human skeleton and with its weight of 8kg, this will definitely give you an almost realistic weight of approximately 200 bones. This 3B Scientific human skeleton replica is highly flexible and moves just like the real thing because Fred’s spine can be bend to mimic any natural human movement. And the good thing about this is it will remain fixed in its position once it is flexed to further demonstrate the correct and incorrect posture or various pathological conditions. In addition to that, it has a 3-part mounted skull and the spinal nerve exits and vertebral arteries are revealed as is dorso-lateral disc prolapse between the 3rd and 4th lumbar vertebrae. And with regards to quality, this flexible skeleton Fred has an excellent price-performance ratio. It is made of a durable, unbreakable plastic and this is, in fact, a first-class natural cast that is made in Germany. Aside from that, this also comes with a three-year warranty. This is also very easy to assemble because it only needs manual assembly. HIGHLY FLEXIBLE- This 3B Scientific human skeleton replica is highly flexible and moves just like the real thing because Fred’s spine can bend to mimic any natural human movement. WARRANTY- This flexible skeleton model Fred includes a three-year warranty. DURABLE- This is made of a durable plastic material which makes it unbreakably tough. MANUAL ASSEMBLY- This is very easy to assemble and only needs manual and basic assembly so you don’t have to be professional for you to be able to assemble this model. STAND-Flexible Skeleton Fred model comes with a stand which is attached to its pelvis to keep the skeleton standing while you are doing the presentation. And since it is a roller stand, you can easily move or maneuver the skeleton anywhere in the room. DUST COVER-It also comes with a dust cover, keeping the skeleton model dust and dirt FREE. I Teach Children to kill using this training aid. It is perfect for teaching combat skills needed to Get through High school. On the down side His bones can not be reset once Broken. particularly the neck bone , my model Now has Duct Tape holding the Neck together after teaching so many of my students to administer instant death Via a cleanly snapped Neck and Severed Spinal cord. We use Flexible Fred to teach ski coaches about anatomy. Fred's detail is perfect. We can identify muscle attachments and his spine articulation helps us make some important points about human articulation.